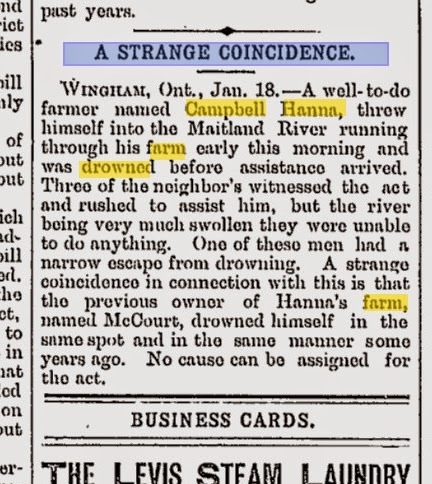 I've been looking at some old publications recently and came across this Strange Coincidence story from the Quebec Daily Telegraph dated January 18, 1890. "A well-to-do farmer named Campbell Hanna, threw himself into Maitland River running through his farm early this morning and was drowned before assistance arrived. Three of the neighbours witnessed the act and rushed to assist him, but the river being very much swollen they were unable to do anything. One of these men had a narrow escape from drowning. A strange coincidence in connection with this is that the previous owner of Hanna's farm named McCourt drrowned himself in the same spot and in the same manner some years ago. No cause can be assigned for the act." And here's another one, this time from The Free Lance Star of October 27, 1966. "Robert Kennedy was grounded. He was travelling from California, where he had been campaigning for Pat Brown, to Massachusetts, where he was going to campaign for Endicott Peabody. 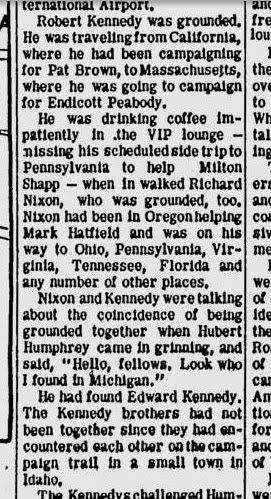 He was drinking coffee impatiently in the VIP lounge - missing his scheduled side trip to Pennsylvania to help Milton Shapp - when in walked Richard Nixon, who was grounded, too. Nixon had been in Oregon helping Mark Hatfield and was on his way to Ohio, Pennsylvania, Virginia, Tennessee, Florida and any number of other places. Nixon and Kennedy were talking about the coincidence of being grounded together when Hubert Humphrey came in grinning, and said, "Hello, fellows. Look who I found in Michigan." He had found Edward Kennedy. The Kennedy brothers had not been together since they had encountered each other on the campaign trail ina small town in Idaho."